1. Burrito Benefit, the New York Chapter of Les Dames d'Escoffier will hold a fundraiser to support the organization's Green Tables garden-to-School program on Wednesday, September 27, 5:00 p.m. to 8:00 p.m., at Chipotle at Union Square, 864 Broadway. Diners may purchase any menu item and drink for a $5 donation (all proceeds go to Green Tables). 2. Wine Week, sample $10 wines for $10 with lunch at eateries in the Smith & Wollensky Restaurant Group, Monday, September 25, through Friday, September 29. Visit nationalwineweek.com for more information. 3. Queens Restaurant Week, partake in three-course prix fixe lunches and dinners for $19.86 at participating Queens restaurants, September 18 to 21 and September 25 to 28 (718.263.0546). 4. The History of Pain Poilâne, The French Institute Alliance Française will present a bread tasting and discussion led by Apollonia Poilâne, granddaughter of Pierre Poilâne, founder of Pain Poilâne, will discuss the history and technique of Paris' famous bread, Thursday, September 28, 7:00 p.m., at Le Skyroom, 22 East 60th Street, 8th floor (between Park & Madison). $40/person (646.388.6669). 5. Grand Central Oyster Frenzy, the Grand Central Oyster Bar will present a three-day oyster extravaganza kicking off with an feast of unlimited oysters on Thursday, September 28, and Friday, September 29, followed by an Oyster Carnival on Saturday, September 30, featuring cooking demonstrations, a shucking competition, and a "slurp off" (for tickets, reservations and information, contact the Grand Central Oyster Bar at info@oysterbarny.com or 212-490-6650). 6. Portfolio Winetasting, The Fort Greene Park Conservancy will be hold a wine tasting fundraiser to benefit the Conservancy and its initiatives to improve Brooklyn's historic park, Thursday, September 28, 8:00 p.m. to 10:00 p.m., at the Brooklyn War Memorial at Cadman Plaza. $75/person general admission; $125/person for a VIP tasting and class held from 6:00 to 8:00 p.m. (for tickets or more information, please email amy@greenegrape.com). 7. The Joy of Sake, this sake tasting event -- billed as the largest such event in the U.S. and outside of Japan -- will feature 299 premium sakes paired with dishes from restaurants including wd-50, Bond. St., and Megu, Thursday, September 28, 6:00 p.m. to 9:00 p.m., at The Puck Building, 295 Lafayette Street. $75/person in advance, $90/person at the door (212.799.7243). 8. For the Love of Sake: David Bouley's Passion, the Japan Society will present a sake tasting event led by chef David Bouley, on Saturday, September 30, at the Japan Society, 333 East 47th Street. A session at 3:30 p.m. is open only to Japan Society members; a 6:30 p.m. session is open to the public. $35/person (212.715.1258). 9. Brooklyn Eats, the 10th annual edition of this tasting event featuring dishes from more than 55 restaurants, will take place on Tuesday, October 3, 6:30 p.m. to 8:30 p.m., at the New York Marriott at the Brooklyn Bridge, 333 Adams Street. $75/person in advance; $95/person at the door (866.468.7619). 10. Baking the Perfect Loaf of Bread at Home, Sullivan St Bakery's Jim Lahey will teach a course on achieveing baking perfection at home, Sunday, October 1, 5:00 p.m. to 8:00 p.m. The course is the first in a series of pizza, focaccia, and panettone classes being offered throughout October at Sullivan St Bakery, 533 W. 47th Street between 10th and 11th Avenues. $150/person (646.442.2398). 11. How to Make Yourself an Espresso [Big] Shot, learn espresso essentials -- from proper grind texture and packing technique to water temperature, extraction time, and crema color -- in this introductory class, Thursday, September 28, 7:30 p.m., at Joe The Art of Coffee, 9 East 13th Street. $10/person 21st and again on September 28th). $10/person (212.924.7400). How many of you cookbook collectors out there picked up a copy of The Silver Spoon last year only to leave the behemoth languishing on your bookshelf to gather dust. I confess that I did. The massive tome, dubbed Italy's version of The Joy of Cooking, is omnivorous, taking in anything and everything from traditional regional pastas like Liguria's pansotti to riso al cury con gamberi ("rice with curry sauce and shrimp"). 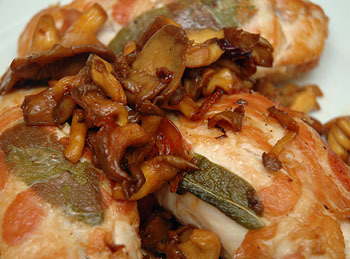 I recently hauled the big book down from the shelf, and while leafing through it came across a simple recipe for involtini di pollo alla salvia, chicken breasts rolled with sage and wrapped in pancetta. There's no no end to the possibilities for rolling (and no less than 22 involtini recipes in The Silver Spoon), but this is a particularly inspired combination. And, how could you go wrong with anything that's wrapped in bacon? If you’re the type of cook who’s overly generous with lending your personal library, consider inserting gastronomically-inspired bookplates into the front covers of your collection. These paper goods are attractive and theme-appropriate, and will give you a little piece of mind. Now your so-called friends won’t be able to easily abscond with your precious Marcella volume. $9.99 for a pack of 20 at Italian Papers & Gifts. A robe for your romaine? How about some outerwear for your Absolut? As seen at Oh Gizmo! the Ice Jacket is a mold that will encase a bottle of liquor in a sleeve of frozen water. Just insert the bottle in the mold, add water, and place in the freezer to chill. When the device is removed, a built-in drip tray collects water as the ice melts. The Ice Jacket will be available for delivery in the U.S. starting in January 2007. For more information, visit icejacket.com. Luckily for new parents, the field of board books written for foodies in-progress is becomming more crowded. One standout is Yum! (not to be confused with the also delightful Yummy Yucky). This entry in the Flip-a-Shape series teaches tots to recognize shapes while they build enthusiasm for fruits, veggies, and cheese. $8.95 at Amazon. 1. Queens Restaurant Week, partake in three-course prix fixe lunches and dinners for $19.86 at participating Queens restaurants, September 18 to 21 and September 25 to 28 (718.263.0546). 2. The Story of Corn, New York University will present a discussion with historian Betty Fussell, author of The Story of Corn, on the role of corn "in conditioning our palates and the rise of the processed food industry," followed by a corn-themed tasting menu, Wednesday, September 20, 6:30 p.m. to 8:30 p.m., at NYU's Torch Club, #18 Waverly Place. $100/person (212.998.7171). 3. Sagra del Maiale, il Buco restaurant will hold its annual outdoor pig festival featuring heritage roast pork, porchetta panini, and more, Thursday, September 21, 12:30 to 7:00 p.m., at il Buco, 47 Bond Street. $7/tasting (212.533.1932). 4. Olive Oil Tasting, Stonehouse California Olive Oil will present a tasting of extra virgin olive oils and dishes and desserts made with olive oil, Friday, September 22, 5:00 p.m. to 10:00 p.m., 273 East 10th Street (212.358.8700). 5. Sweet Corn Festival, annual outdoor festival includes hay rides and "Pigtuckey Derby" pig races, Saturday, September 23, and Sunday, September 24, 11:00 a.m. to 6:00 p.m., at Heaven Hill Farm, 449 Route 94, Vernon, New Jersey (973.764.5144). 6. Greenmarket Cocktail Party, Slow Food NYC will present a celebration of the 30th anniversary of the Greenmarket, featuring Greenmarket-inspired cocktails mixed by Audrey Saunders, on Monday September 25, 5:00 p.m. to 7:00 p.m., at the Pegu Club, 77 West Houston St. $60/Slow Food Members, $65/non-members (reserve online). 7. The Lure of the Loire, Culinary Insiders will present pairings of wine and regional dishes from France's Loire Valley, Monday, September 25, 2006, 7:00 p.m. to 9:00 p.m., at Divine Bar West, 236 West 54th Street. $65/members, $75/non-members (reserve online). 9. What to Eat, Marion Nestle, author of What to Eat, will discuss the complex food choices faced by the modern consumer, followed by a tasting of products from Murray's, Tuesday, September 26, 6:30p.m. to 8:00 p.m., at Murray's Cheese, 254 Bleecker Street. $50/person (212.243.3289, ext. 12). The arrival of a child in our lives has not been good for culinary inspiration. A general state of parental exhaustion has caused us to turn to take-out menus more often than cookbooks to put dinner on the table. But, a change may be afoot. Until recently, Anya has subsided mostly only breast milk, along with the gradual introduction of baby food. But, for the past couple of months she's started to eat "table food" (in other words, the same stuff that you and I eat, only in tinier pieces), and now that she's actually eating with us, there's a whole new reason to cook. 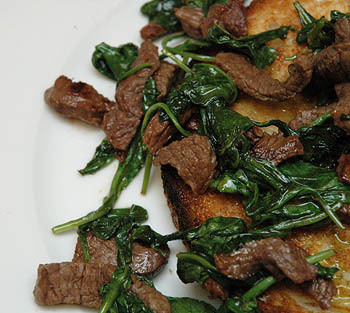 This is a roundabout way of introducing Suzanne Dunaway's recipe for Straccetti con la Rughetta ("Tattered" Strips of Beef with Arugula), which can be found in her Rome at Home. The dish of thin strips of beef tossed with arugula -- a sort of Roman stir fry -- became part of a repertoire of easy recipes for those rare times over the course of the past year when I have cooked at home. Not only is it tasty, but, for speed and simplicity, it can best the Rachael Ray oeuvre. Dunaway suggests alternative variations, including replacing the arugula with slivers of artichokes (Carciofi alla Romana) or thin strips of zucchini sauteed until crisp.